The paramount concern of each and every person who relocates a new home is convenience. 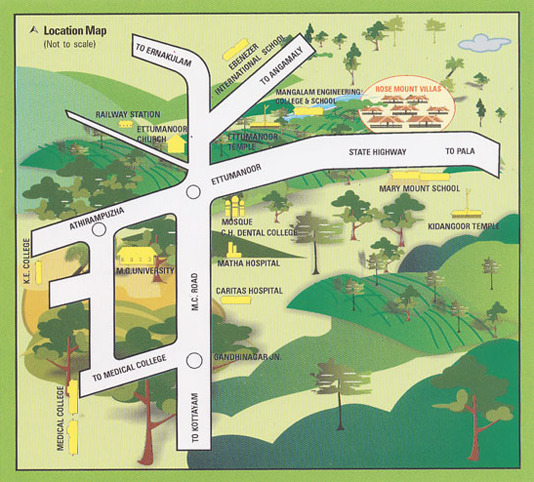 Rose Mount is situated in a location with urban conveniences like schools, hospitals, shopping and public utilities. The Ettumanoor-Pala State Highway is in fact a prominent commercial route connecting the commercial towns of Ettumanoor and Pala with MC Road. The suburbs of Ettumanoor are fast emerging as a throbbing residential and commercial area. Many schools and colleges have recently come up in this area. Proximity to educational institutions like the Mahatma Gandhi University and Medical College has made it a desirable locality. For the religious minded ones this is the ideal spot for living as there are a number of temples, churches and mosques nearby. The greenery of the surrounding areas give freshness and liveliness while the noiseless air soothes the mind, body and soul.